I don't understand why sandals would have ankle cuffs. Keep your ankles warm during breezy summer nights? Are these the wristbands for your ankles(maybe you have sweaty ankles)? 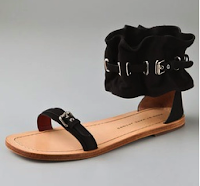 There are so many things that I don't like about these Marc sandals: the thin, horizontal vamp seems impractical, the buckles look like they came from a very average Coach bag, and of course the ankle cuff. Between the thin vamp and chunky ankle cuff, the shoe looks extremely unbalanced. These babies are yours for just 400! 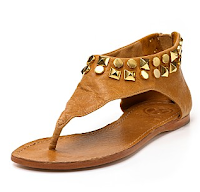 I can tolerate the Tory Burch Stud T-strap flats. Although the shape of the sandal still seems a bit silly, the zipper in the back is fitting for an ankle cuff. As a whole, the design of this shoe flows. And they're 100 cheaper than the Marc pair! I think some girls can pull the right pair off, with the right legs. Not me and for the most part, I am not a huge fan of these.